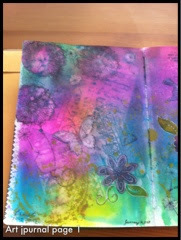 This weekend my sister came over and we worked with some more Dylusion Inks - so fun! She sprayed on watercolour paper and cut it up to make some really cool card backgrounds, which she embellished. 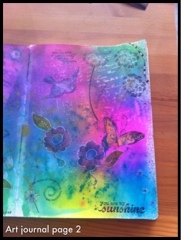 I worked on my Art Journal. I sprayed my background first and then spritzed through a stencil with water for a bleached effect. 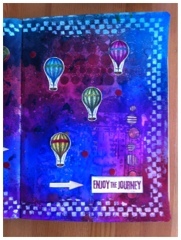 I used the Dyan Reaveley stencil with the circles and then used Picket Fence Distress Stain on the checked border. 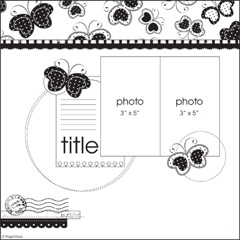 I also picked up her stamp set with the leaves and borders, which I love!! I did some stamping and painting and then wanted to brighten it u a bit so I stamped some balloons on watercolour paper with Archival Ink and watercoloured them using Tombpw markers. I stamped a few of Tim Holt's stamps on white paper, distressed them and glued them on. I also had a piece of sticky back canvas which I cut out a couple balloon shapes and circles from and stuck them on my page. 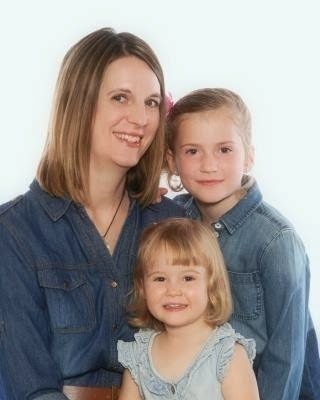 Amie's 6th birthday is fast approaching - wow, where did 6 years go?!! She's having it at a venue that's providing loot bags, but I wanted to give a little treat out as well. Also, she's having boys and girls so I needed to have something for both. 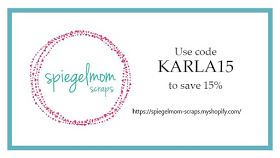 I used my Gypsy and the Art Philosophy Cricut cart, which I turn to time and time again. I turned the fry box cut 90* and increased the size as large as I could go on a 6x12 mat, which ended up to be about 6" wide and 9" long. I cut both the butterfly and the star from this cartridge as well, just eyeballing what size I wanted. 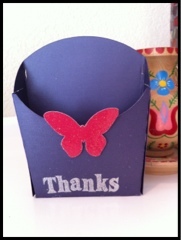 I used a glittery cardstock for both, and I stamped and embossed the Thanks at the bottom with silver embossing powder. After putting them together I sponged the edges with Distress Ink since the cardstock was white core. I absolutely love the Black Soot Distress Ink! I ended up making 5 boy and 4 girl treat holders and it didn't take long at all. We recently got some family pictures done and I had them take a few extra of the baby since we didn't have any recent professional photos. 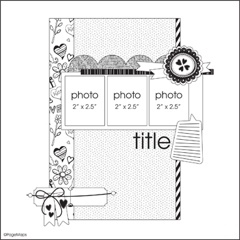 I saw a really cute and easy video mini album tutorial by Linda Bauwin using one sheet of 12x12 cardstock and decided to join in the fun over at Scrapbooker's Paradise Celebrate challenge this week where they are celebrating their 100th challenge! 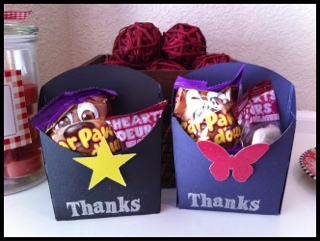 They have some great prizes to be won so be sure to check the blog! 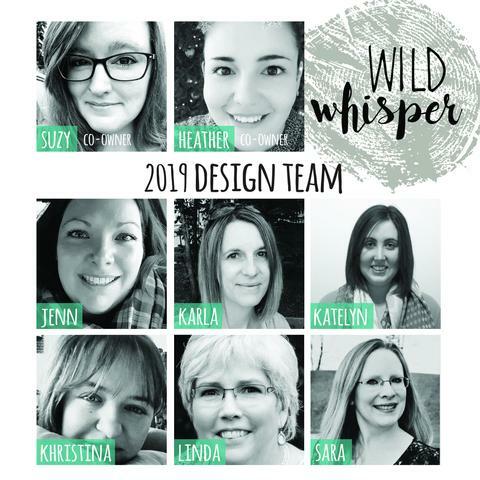 I also found 2 new (to me) challenge blogs so I'm entering those too! 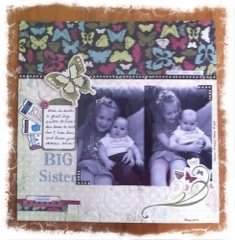 Dutch Dare blog's challenge this week is to use buttons and Card Crafter's Circle challenge is to use layers. 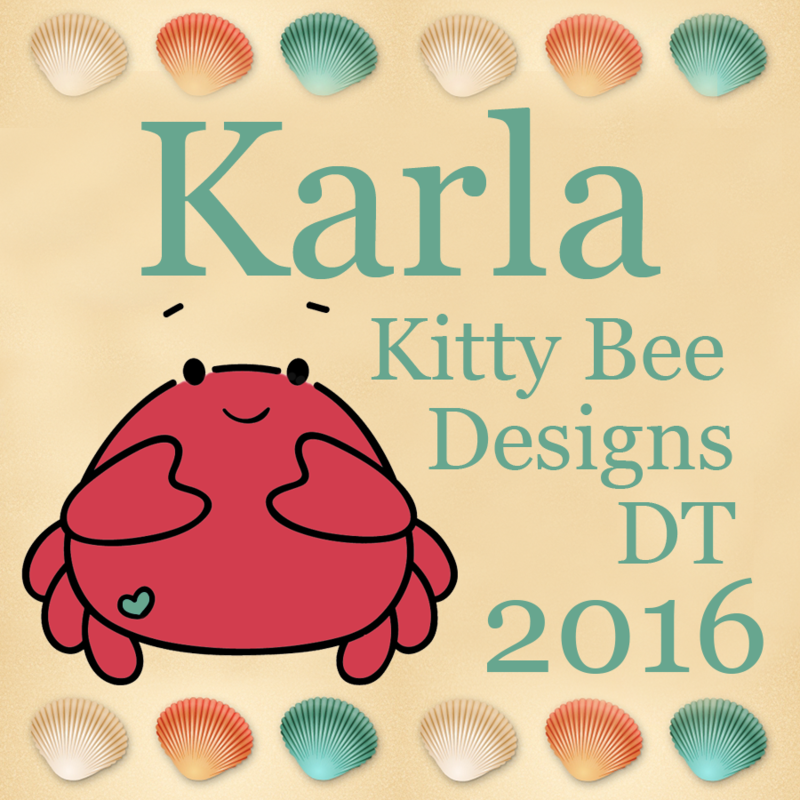 I am using the CTMH Wings kit, which has lots of beautiful paper and fun stickers and embellishments, including buttons! The mini album is made from Kraft cardstock - which I love! 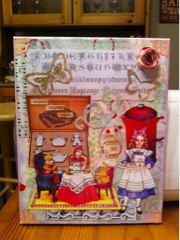 I used heart rub-ons, a Love stamp along the bottom and two sticker buttons layered on top of the paper. I stamped Celebrate along the paper band. I layered a length of paper over the bottom pockets and placed my tags inside. 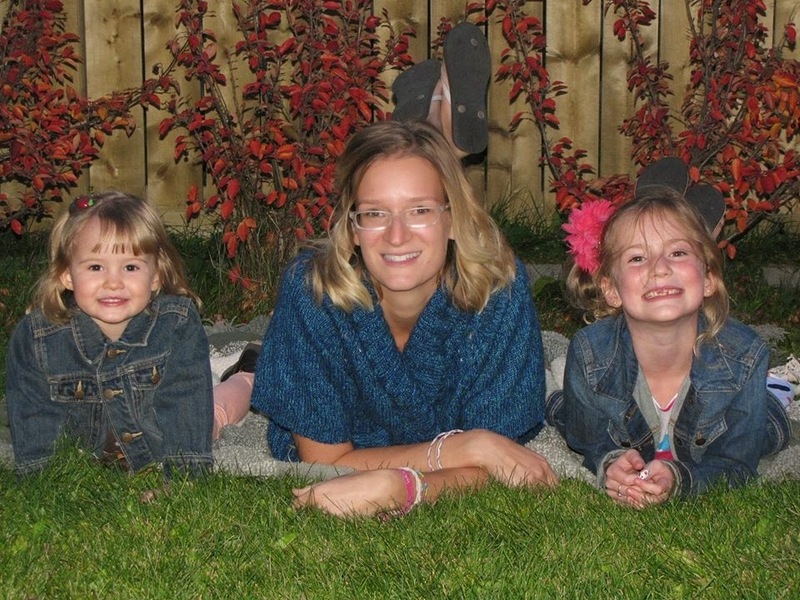 I used black soot Distress Ink around the edges and cropped the photos to fit. I used red ink to Distress the edges of these tags and stamped along the bottom of each tag. I added stamps, stickers, brads and ribbon. Have a look at the black brads below the ribbon - they are little tiny buttons! How cute! I cut a piece of matching butterfly paper to fit inside above the pocket. Thanks for joining me! Happy Monday! 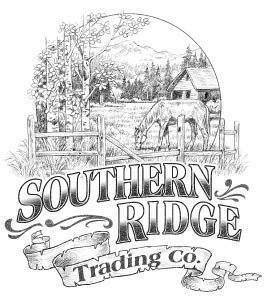 I really like using a sketch as inspiration and there are some great sites out there as well as great Pinterest ideas. 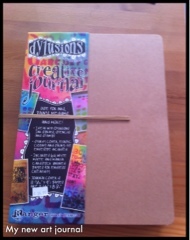 I am so excited to start some art journalling in the beautiful Dyan Reavely Art Journal! I purchased 3 of the Dylusion sprays, which are gorgeous! I will definitely have to put more of those on my wish list! I sprayed the inks on, spritzed water over stencils to create a bleaching effect, sprayed ink through the stencils and turned them over to create a negative impression as well, stamped with black archival ink, used Tim Holtz Distress Stains to stencil flowers, painted the butterflies and bird with Distress Stains, spritzed with Shimmer Spray, and doodled with a black permanent pen and a white Jellyroll gel pen. This was sooooo much fun! Even after doing all this stuff on the page nothing soaked through to the other side of the paper! It's such a nice journal. I'm so looking forward to trying out lots of new and old techniques. 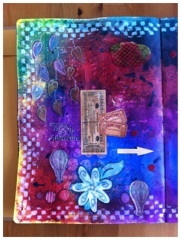 For lots of journalling inspiration check out http://artjournaling.tumblr.com/page/7 and Pinterest has some great ideas as well! 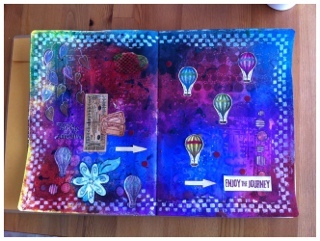 Dyan also has some great videos out showing how to use her inks and how to create amazing journalling pages. Check out http://youtu.be/4kwJxqKJYj8 . On New Year's Day this year my beautiful sister came over and we made collages! 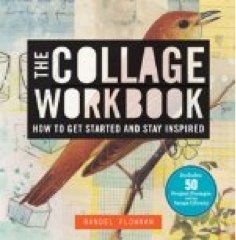 I've always looked at collages and wanted to try them but didn't know where to start. 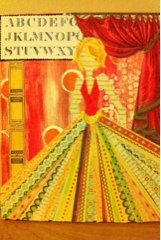 I recently took a brief altered book class, which used collage and just decided to dive in! 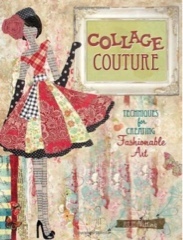 Two great books to get started are Collage Couture and Collage Workbook.